Fig. 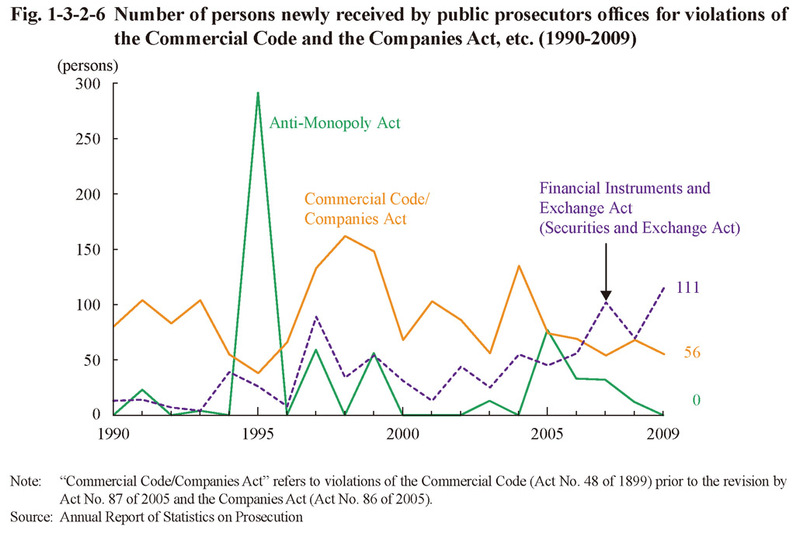 1-3-2-4 shows the number of persons newly received by public prosecutors offices over the last 20 years for obstruction of execution, obstruction of auctions, bid-rigging, and violations of the Bankruptcy Act (Act No. 75 of 2004; Act No. 71 of 1922 before abolition under Act No. 75 of 2004 for the period up to December 2004). 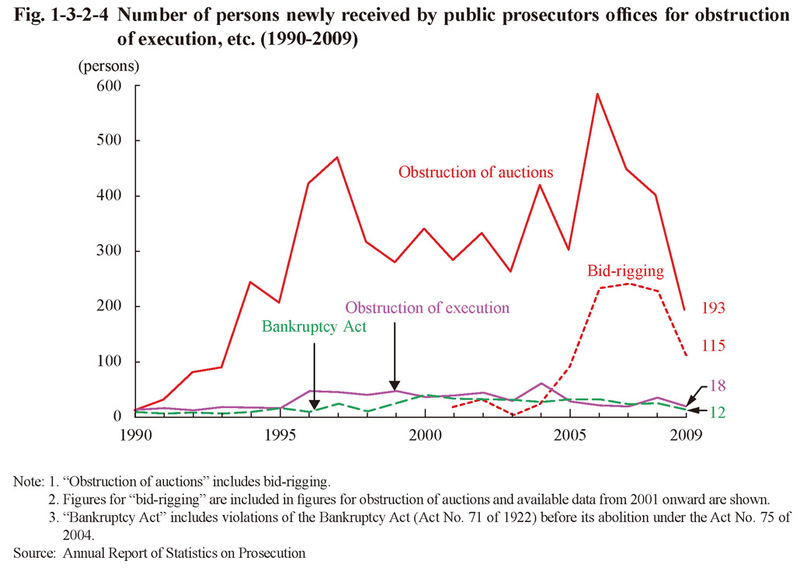 The number of persons received for obstruction of auctions (including bid-rigging) sharply increased between 1994 and 1997, and then remained at a high level. In 2009, however, it decreased by 51.9% from the previous year to 193, which was the almost the same level as that in 1995. Table 1-3-2-5 shows the number of persons prosecuted or not prosecuted for obstruction of execution, obstruction of auctions, bid-rigging, and Bankruptcy Act violations over the last five years. 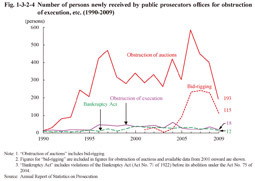 Examining the details of prosecutions in 2009 revealed that seven persons prosecuted for obstruction of auctions and 43 persons prosecuted for bid-rigging were put on the summary trial procedure and all the others were indicted (Source: Annual Report of Statistics on Prosecution). Fig. 1-3-2-6 shows the number of persons newly received by public prosecutors offices for violations of the Commercial Code (Act No. 48 of 1899 prior to revision by Act No. 87 of 2005), the Companies Act (Act No.86 of 2005; enforced on May 1, 2006), the Anti-Monopoly Act, and the Financial Instruments and Exchange Act (Act No. 25 of 1948; the title of the act was “Securities and Exchange Act” prior to September 30, 2007) over the last 20 years. In FY 2009 the Securities and Exchange Surveillance Commission filed formal accusations regarding Financial Instruments and Exchange Act violations against a total of 46 persons (including juridical persons) in 17 different cases. 13 of them were involved in seven cases of being accused of “insider trading,” 13 persons in three cases of “market manipulation,” 10 persons in four cases of “submission of false securities reports, etc.,” and 10 persons in three cases of “spreading rumors and fraudulent means, assault, and intimidation” (Source: The Securities and Exchange Surveillance Commission). The Japan Fair Trade Commission filed no accusations for Anti-Monopoly Act violations (Source: The Japan Fair Trade Commission). 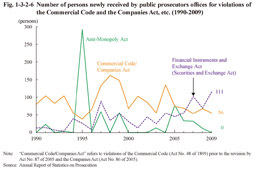 Table 1-3-2-7 shows the number of persons prosecuted or not prosecuted for violations of the Commercial Code, the Companies Act, the Anti-Monopoly Act, and the Financial Instruments and Exchange Act (Securities and Exchange Act) over the last five years. Examining the details of prosecutions in 2009 revealed that two persons prosecuted for Financial Instruments and Exchange Act violations were put on summary trial procedures and all the others were indicted (Source: Annual Report of Statistics on Prosecution).